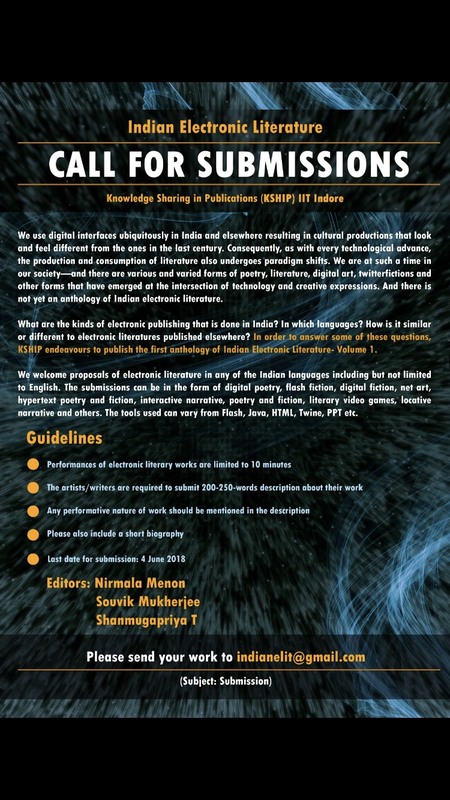 The submissions can be in the form of digital poetry, flash fiction, digital fiction, net art, hypertext poetry and fiction, interactive narrative, poetry and fiction, literary video games, locative narrative and others. KSHIP is an Open Access Publisher of peer reviewed open access books, journals and other forms of academic publishing. We are a part of Ubiquity Press’s partner network of university open access publishing. KSHIP is a lot of things - it means ‘inspired’ in Sanskrit, our institute IIT Indore is on the banks of the Kshipra river and it expands to Knowledge Sharing in Publishing.